I am not a great lover of coffee! The inspiration for this shoot came from a true love of coffee and not just any coffee, but the super duper amazingly rad coffee house, Case Coffee located in Ashland, Oregon. The shoot design was one of edginess meets quirky fun. 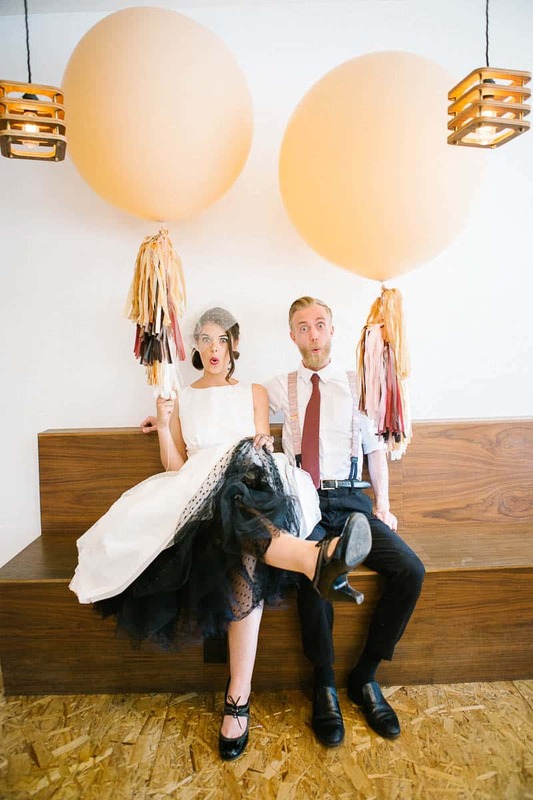 The gigantic balloons and tassels from Prospect Goods brought out the fun and excitement of this shoot and kept everyone laughing throughout the day. Who doesn’t love gigantic balloons? Our bride had a sense of elegance with her natural beauty and an added bonus of tattoos that kept with the edgy raw part of our shoot. Her dress kept with the theme of the wedding in choosing a tea length dress with a flair of black swiss dot underneath. The hair piece added a level of fun and whimsy while adding elegance to her overall look. The groom wore suspenders, a marsala colored tie and rolled up sleeves that kept with the overall relaxed feeling of this offbeat wedding. Guests would be able to sip on their favorite coffee beverage while grabbing a little donut snack with the bride and groom. The table decor was on trend with the Pantone color of the year, Marsala, while adding a custom napkin design and the ever cool brushed copper cups and stemware. The floral arrangements were kept tight and simple with rustic wooden and wire vases. Adding elements of your local coffee house to your wedding venue, will show your style and likes to your guests and Coffee houses are of course great places to host a small group of friends and family.